Welcome to this resource at All Digital Photography. This is your source to learn all about using your camera Whether you’re a beginner or a professional, on this site I have lots of basic and advanced information and tutorials about all topics of photography; from capturing the images to post processing, to make you become a better image maker. I also cover new ideas and suggested subjects for photography. I am just an Aussie that loves using my camera and getting out and about. “Sometimes I get to places just when God’s ready to have somebody click the shutter.” —- Ansel Adams. All images are copyright © Geoffrey Ronalds, and all rights are reserved. No images should be copied, published or used in any way without my written permission. 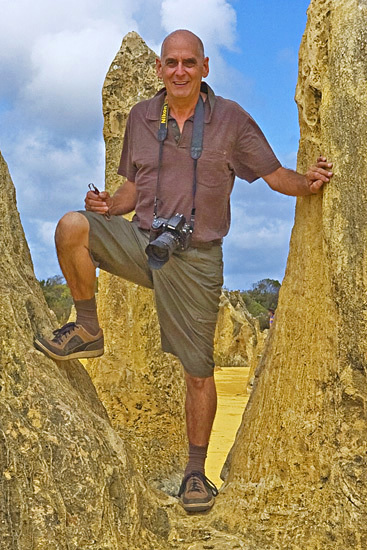 The author of All Digital Photography is Geoff Ronalds who has been involved in photography for over 50 years. He has had images published in news media, travel publications and in photography magazines. At All Digital Photography, digital Nikon cameras and lenses are used, covering a wide range of focal lengths, together with a range of Nikon micro lenses for close up photography. I reside on the Gold Coast, Queensland, Australia, but have photographed nearly every corner of Australia. My love is the outback of Australia and also the animals and in particular the birds of Australia. All Digital Photography has many articles covering general principles, lens aperture and f stops, influencing exposure, the effect of shutter speed and ISO speed on exposure, exposure value, white balance and color temperature. There are articles on lenses and focal length, how focusing and f-stops effect the depth of field and the effect of long exposure on the final image. I also have many articles on aspects relating to the choice of camera and lenses and how that may affect your image making. The aim of this photography site is to bring new ideas on photography to you, to assist in improving your photography, by showing you examples and tutorials which will help in your photographic development. I am also introducing photography tips to give you general photography ideas to help you improve your image making and give you new ideas. I also like to introduce reviews of my equipment, being an Engineer I really like the technical side of the business, including digital cameras and the many types and application of lenses. Hopefully I can help you make the best decision on purchasing your equipment. I use Nikon camera equipment with lenses ranging from 14mm (Nikon AF-S Nikkor 14-24mm f/2.8 G ED) to 1,000mm (Nikon AF-S Nikkor 200-500mm f/5.6 E ED VR lens with the Nikon TC-20E III teleconverter). I will be regularly adding information to the blog and also to the image galleries. If you would like any specific articles written on the Blog please let me know at contact. I hope you enjoy my “All Digital Photography” site and that you get some benefit from it.